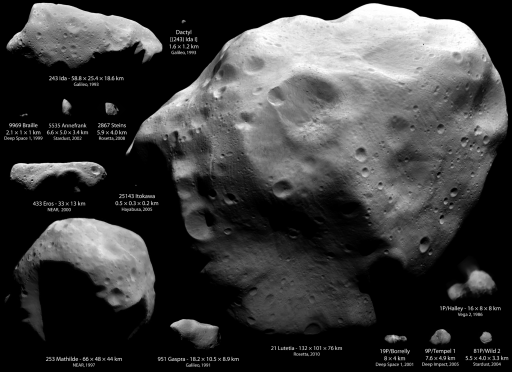 The image above is a composite compiled by the Planetary Society's Emily Lakdawalla, handily showing the relative sizes of all the asteroids and comets that have been visited by spacecraft to date. Check out the full-size version here. The largest by far is Lutetia, which the Dawn* spacecraft has just zipped past, on its way to even larger targets - Vesta in 2011-12 and Ceres, the largest body in the asteroid belt, in 2015. Vesta is about four times the size of Lutetia; Ceres, at an average 950 kilometres in diameter, is seven times larger. If it orbited Saturn it would be the gas giant's sixth largest moon (it's just a little bit smaller than Tethys), and is classified as a dwarf planet rather than an asteroid. Both Vesta and Ceres are massive enough to have been pulled into a spherical shape by their own gravity, and both are differentiated bodies with metallic cores and stony crusts. Vesta's surface is mostly rock, modified by flows of lava; Ceres is surfaced with water ice and clays and carbonates, and it's possible that there's an ocean of liquid water beneath its crust. Asteroids are fantastically varied objects. Those imaged close-up all seem mostly similar, spattered with craters large and small, and with dusty intercrater plains. But while Eros, Ida and Itokawra are stony asteroids composed of iron and magnesium silicates, Mathilde is coated in primitive carbonaceous compounds, and tiny Braille is composed of olivine and pyroxene (Gaspara's composition appears to be midway between Braille and the stony asteroids). Lutetia is presently classified as a M-type asteroid; its dusty surface may cover a chunk of nickel-iron and other metals derived from the core of a larger body shattered during the early history of the Solar System. 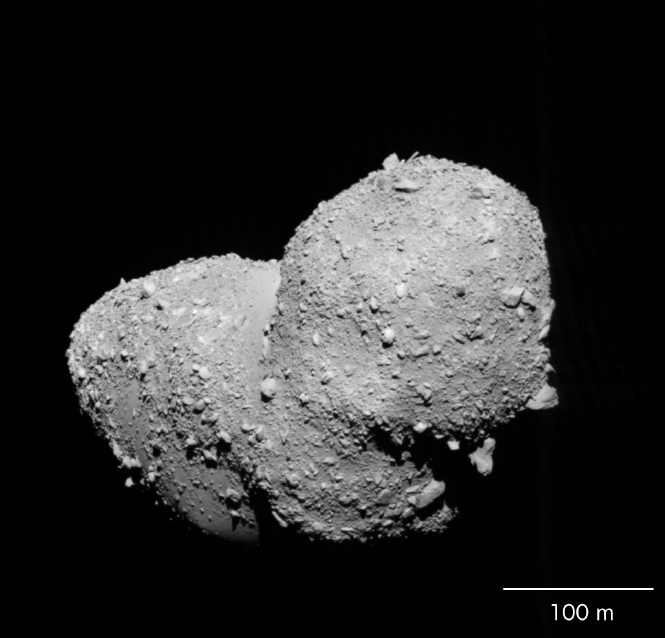 Itokawa, visited by the Hayabusa probe, which recently returned to Earth after a difficult five-year journey, is a rock pile, with a surface of dust and boulders mostly unmarked by impact craters. Hard to think of making any kind of comfortable living on or in something as frankly ugly as that, but it's easy to think of tenting over a small crater of one of the other asteroids, or burrowing into their surfaces, or hanging sealed tenement buildings at the edges of cliffs. Smaller asteroids could be completely built over - mini-Trantors. (Many small asteroids are rock piles like Itokawa, putting paid to the cherished sf idea of manufacturing a habitat by hollowing out a small rock with a few nuclear bombs.) Although the total mass in the asteroid belt is just 4% of the mass of the Moon, the surface area is far greater. At an average diameter of around 130 kilometres, Lutetia has a surface area of some 31000 square kilometres, one and a half times the size of Wales. Plenty of room for settlements and cities. Tiny disputatious kingdoms and empires brought together and flung apart by orbital mechanics, trading with each other and with Earth and Mars, chasing after comets for water and organics . . . It's been done before, of course. Many times. But I can't help thinking that it may be time to do it again. *EDIT My bad - it was the Rosetta spacecraft that zipped past Lutetia, on its way to rendezvous with comet 67P/Churyumov-Gerasimenko. Dawn is, however, on course for Vesta and Ceres. Hat-tip to Phil, for pointing out my confusion. So I finished the second draft of the new novel yesterday, and here it is, printed off. 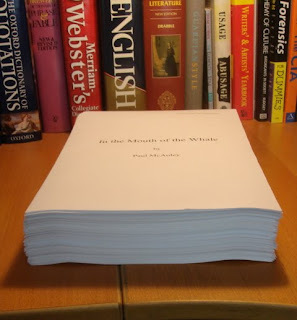 Hmm, 150,000 words plus doesn't look as big in the real world . . .
Now all I need is a break, and then a couple of red pens and a decent stretch of peace and quiet so that I can cut it into shape. Some people can compose and redraft and edit entire novels on screen. I need at least one go at an actual manuscript, with wide margins for notes and second- and third-thoughts. I started off writing on a manual typewriter, old habits die hard, and it's easier to spot goofs on the page than on the screen, for some reason. After that, there's at least one more on-screen draft before it's printed out again, and sent off to the publisher. The title is a working title, by the way. Not yet officially approved. But I like it. The Astronomy Picture of the Day site regularly throws up amazing images, but this one is especially amazing. A lane of dust about 500 light years away and spanning some 100 light years runs across the sky towards an area rich in stellar beauty: a fabulous backdrop for a space opera about clashing interstellar empires.